In a part of the coast ravaged by decades of constant Prawn trawling and where in recent decades some species have become almost extinct, against all odds the Tope continues to thrive and provide top class sport off the coasts of this county steeped in myth, legend and just the odd fishy tale. 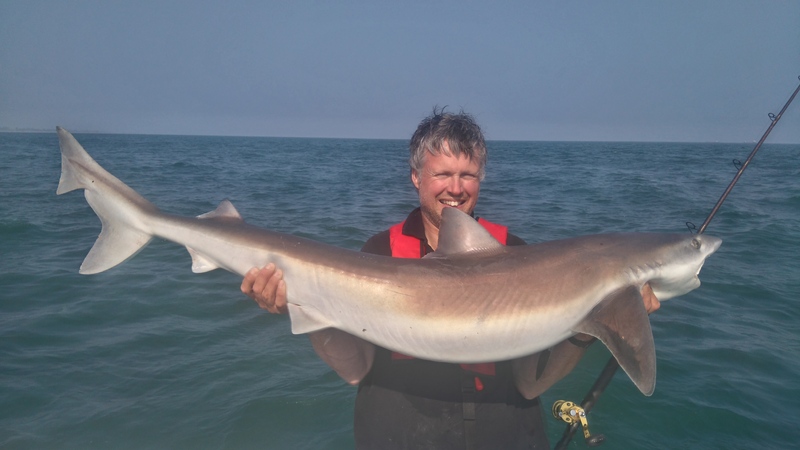 It’s fair to say that Tope are at the top of the food chain for roughly six months of the year off these mainly sandy shores. They are found mainly at depths from 12 to 70 feet, but indeed often feed in even shallower water especially under the cover of darkness. Some local seatrout anglers have been heard to shout “Shark” whilst wading at dawn or dusk. Tope run big around these parts, looking through my records for the past dozen or so years I have found the average Tope I have caught to be in the region of 34lbs. 40lbers are commonplace with numbers of 50 and 60 pounders caught each year. 70+ pounders have been caught and an 80 is in my opinion a realistic target to aim for. Some private boat owners target Tope exclusively off the Louth coast. While I don’t fall into that category I do spend quite a large proportion of my fishing year in pursuit of the grey Torpedoes. Here I’m going to go into some detail describing the fishery and how I go about catching them from a small boat. With the water being shallow off the Louth coast and the tidal currents not being especially strong heavy rods are not required. While a 12lb class boat rod will suffice as 12/20 is a better option. I don’t like a rod that is too soft to control a feisty Tope at close quarters. Over the past few years I have switched over to uptide rods, the reasons being that some marks require casting, better control over Tope during the fight and I find the extra rod length makes using the longer traces I prefer much easier. Some marks here are very shallow, and tope will often jump clear of the water and wrap themselves up in your trace. These can be saltwater resistant Baitrunner type reels, lever drag or star drag multipliers of a “7000” size or similar. Trace material is your personal preference, I tend to use nylon coated wire of 120 to 150lb. In my experience Nylon is too easily bitten through if there is a delay during the fight, for example, if the mainline gets snagged under a rock of if say another Angler’s lines tangle in your own. For mainline I prefer 50 to 65lb braid to 10 meters of 50lb mono rubbing trace. I use circle hooks for all my Tope fishing. Size 8/0 is a good size to start with. I use VMC tournament circles, other good brands are Owner, Eagle Claw and Sakuma. Gaffs are a big no, no. A tailer or looped rope are better options for lifting a fish inboard for measuring, photo’s etc. I tend to lean over the gunnel and grab the Tope by the Pectoral and dorsal fins simultaneously but high freeboard on your boat may prevent that. If there is a really strong tide running I sometimes like to fix the lead and nail everything to the sea bed. Fixed Grip and breakaway leads are seldom necessary but I always carry a few onboard if I need to fish well uptide or across the tide in a strong flow. Free lining is often possible and productive over slacker tides. Use Mackerel flappers. Float fishing indeed can be very useful when fishing very shallow clear water where the Tope may be spooked by the presence of the boat. I like to keep my baits in the bottom 5 feet of water, the exceptions to this can be at dead slack water and dawn and Dusk when our Tope are more likely to feed well of the bottom. Due to the snaggy undulating sea bed in many local marks floatfishing is a good way to present your baits while fishing on the drift. Finally Sending a floatfished Mackerel way downtide from an anchored boat can be a good tactic for avoiding tangles on a crowded boat as well as putting a bait right in the path of the fishy flavours seeping out from the other anglers baits. Live baiting works ok. Personally I very rarely if ever resort to it. Over slack water or when Tope are dropping all sizes of dead baits as soon as they pick them up are occasions when using this method can pay off. Off the Louth coast we’re are talking roughly late May to late October. This overlaps roughly with when the mackerel move inshore and back offshore here. While Tope migration is not dependant on the prevalence of our stripy little friends they definitely harvest them in numbers. 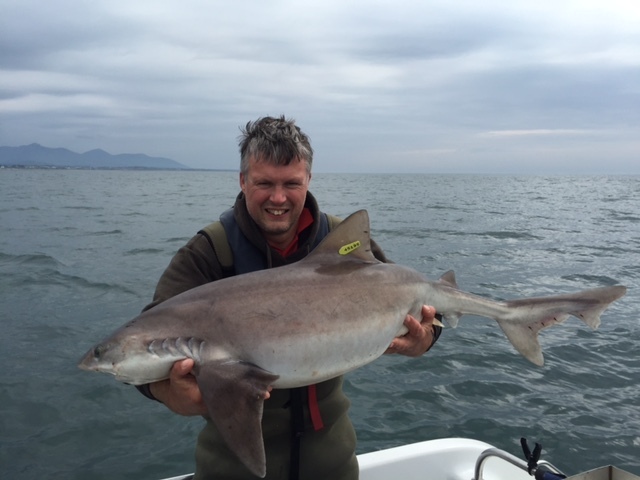 Tope appear to arrive first of all in late May in the waters off Dunany Point, but within a week or two some will be feeding up at the marks at the mouth of Carlingford Lough. These early fish will be a combination of both pregnant and non-pregnant females up to about 60lbs and smaller lean males in the 20 to 40lb category. This is the only time of year I have caught female Tope that looked like they were about to give birth any minute. Finicky feeding as in dropped runs and lost fish due to them being barley hooked can be an early season problem as there does not seem to be the numbers of fish to create competition for the anglers baits and thus more positive takes. June and early to mid-July are a really good time to be out fishing for Tope. Mid-season from late July until the end of August can be a hit or miss affair with Tope appearing to be either absent or off the feed. There is normally of plenty of bait and settled weather and of course good catches are still possible but the angler should not be afraid to keep trying different marks until he finds the fish. Late season from early September to late October is my favourite time to be Tope fishing here. By the 2nd week in October Tope numbers appear to be down as they start their migration, but some Big Females will remain until the end of the month. Fishing through the late season improves the Angler’s odds off catching a “Biggie”. In common with other fish our Tope along here like structure and are especially fond of travelling along the base of reefs where stone meets sand or especially through Channels. One of my favourite places to anchor up tide of the base of a drop off., placing baits at the bottom of the drop off and along it. At Dunany and other marks in Dundalk bay, it is not necessary to anchor close to a feature, but I find even if I do anchor over flat ground I prefer to have a gully leading onto it or a bank or rocky area close by. As we know structure and tidal movement attract prey fish, the Tope will often not be far away. They follow definite paths between feeding and resting areas and after catching one it often pays to cast to the same area, it’s almost like they swim head to tail through some channels. In summary, try to anchor at the base of banks, especially those with a tide running towards them. I.e. Anchor up tide of reefs, drop offs and other features. Sometimes the down tide side of structure can yield Tope, it’s always worth a try. Gullys and drop offs with the tide running along them can also be good, these seem to be used as highways for prey fish and Tope. Finally don’t neglect open ground, these areas are best fished on the drift and anchored on when Tope are found to be in residence. Nothing beats freshly caught mackerel off the Louth Coast. I have never found Tope to ignore fresh Mackerel in favour of other baits. Even Herring which our Tope harvest with gusto in late season don’t come close. Other baits such as whiting, Scad, Flounder and Coalie do produce runs but personally they don’t fill me with confidence. Our Tope normally arrive before our Mackerel start to proliferate. So it is often necessary to use frozen baits or Mackerel from the Supermarket fish counter (I find frozen better than these). This is not a problem though as Tope will readily take these especially if they are injected with fish oil or WD40. Yes I’m totally convinced that WD40 enhances frozen or stale baits. Our local club’s competition results go a long way to prove this. The top Topeman over the past 20 years always drowns his baits in the stuff. However once Mackerel start to show in fair numbers, usually in June the frozen baits start to lose their effectiveness and find themselves almost ignored. As mentioned fresh Herring would be my 2nd favourite bait. I’m convinced large Tope stay around into late autumn to feast on the silver darlings. Some guys do ok with Lamprey, Eels and Blueys. I have not used them often enough to pass on judgement. Some years back I came to the conclusion that it’s not necessary to deploy rubby dubby on most the marks off the Louth coast. My reasons are, the increased scent flow often attracts hoards of bait munching Crabs. Seal’s are also attracted from far down tide and will hang around the boat for longer when you have Dubby down. Indeed they will often rip the dubby bag to shreds to get at the goodies inside. However I will on occasions deploy dubby when fishing a new mark and also to attract mackerel to the boat and on occasion at slack water. I have a 3lb weight on a thin 20 metre rope to which I attach to onion sack type bags containing squashed up mackerel chunks( no need to go for anything more elaborate). When the tide is flowing I drop this to the bottom and the raise it up a foot or two so it bounces on the sea bed. Over slack water I tend to raise the dubby sack up to midwater or even to the surface to increase scent dispersal. Get Tagging! 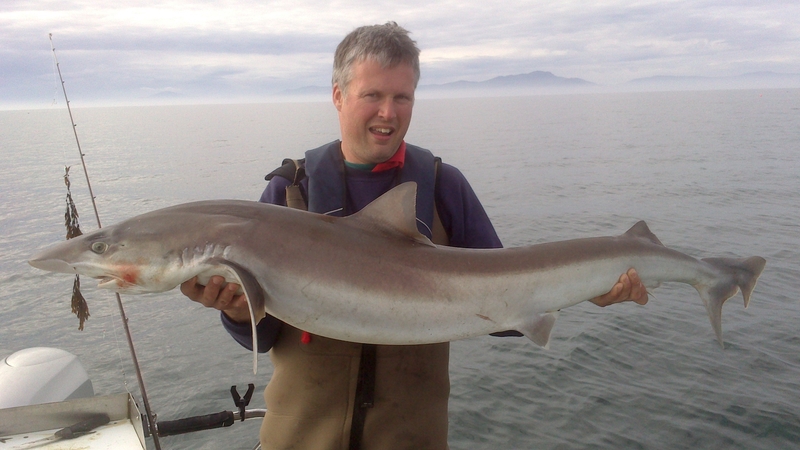 I tag all my Tope for Inland Fisheries ireland. At a minimum it adds an additional layer of interest when you tag, release and log your capture and wonder someday will you or your fiends recapture this fish or will the fish be caught off southern Europe and end up on a fishmongers slab or indeed like many will it simply disappear into the vast ocean to live out the rest of its life to its natural conclusion.